A typical organizational analysis entails observing the organization from the strategic, political and cultural lenses encompassing people, processes and technologies. While these lenses are useful in understanding the workings of an organization, they are not sufficient for an organization to be innovative. To be innovative, organizations need to have a constant flow of ideas that are generated, captured and then shared smoothly up/down and horizontally across the organization. These ideas can potentially turn into products and/or services and thus propel the organization forward and keep them ahead of the competition. 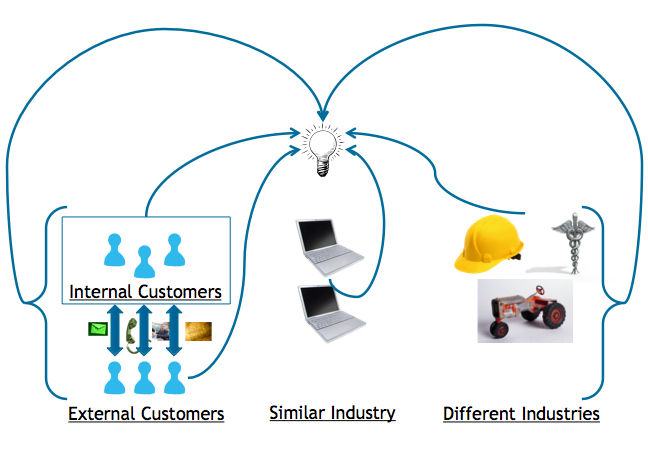 By tapping into the innovation capabilities within the organization through internal customers. Typically people who are closest to the work can tell you what is not efficient and how it can be improved. Taking this information from multiple people and the co-dependencies of processes you can have a holistic idea of what can happen. By becoming a catalyst for innovation for external customers. Think about how new versions of software are released typically based upon new requirements from the customers. Keeping abreast on innovation within your industry. Keeping abreast on innovation outside your industry through cross-pollination of ideas. Think about how concepts of Project Management emerged from construction and are now used in software development. Integration, customization and combination of the above.